In Part One, we evaluated the TED Talk which was allegedly going to make all men feminists. Feminism doesn't inspire men to stand up and be the men God has called them to be. Feminism works towards eradicating any differences between the role of men and women in our society. 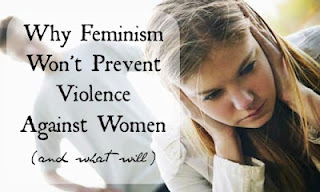 I do not deny that many feminists are concerned with violence against women, but preventing it is not one of the goals of feminism, and is not likely to be an end of it either. Back in my feminist days, I decided to join our city's Take Back the Night march - an event to raise awareness about violence against women, and work towards a community where women can safely walk outdoors after dark. I was planning on going with two friends, one female and one male. When we arrived at the event, our male friend was told he was not welcome to join in the march - it was a "women only" event. The organizers had a "we don't want your help" attitude, even towards men who were willing to stand in solidarity with women towards the goal of creating a safer environment. This is just one example which shows how feminism not only alienates men, even the ones who want to help, but is working against itself in preventing violence against women. There will always be men who make it unsafe for women to walk around at night, what we need are more men who are willing to be the protectors of those women - men who aspire to biblical manhood. Throughout the Bible we see that God emphasizes the value of both sexes, along with the distinctness of men and women, which leads to a framework for preventing violence against women. The Bible holds women in equal worth to men, both made in God's image and given the task together of taking dominion over creation. People who claim Christianity makes women less than men need read no further than Genesis 2 to see otherwise. Husbands are called to love their wives and sacrifice for them as Christ loves the Church! That is PERFECT love. There is no other culture or religion which calls men to such a high standard with regards to their wives. The Bible puts men in a role of protector and provider for the women under their authority (wives, daughters, or in the case of the church, widows and orphans). This is not a power trip, it is a huge responsibility. It is men like this who are going to stop the trend of violence against women, and I know many of them. I am blessed to be married to a man who understands his role before God, and without needing any "leadership" or "sensitivity" training, will stand up against men who speak hatefully or disrespectfully about women. And do you know why? Because he was raised under biblical truths. The speaker talks about how we shouldn't be putting the responsibility on teenage boys, but on grown men. However, if we want teenagers to grow into men who will stand up for what is right - we need to begin teaching them long before they are adults. I believe the number one thing you can do to prevent violence against women is raise up your sons with a true biblical understanding of the value of women, and the role of men. With this as their foundation, they will not need to be told to stand up against violence towards women - it will be the only thing that makes sense to them. Violence against women is a very serious social issue. It is perpetrated in every country, in every culture, and in every religion. However, asserting that becoming better Christians would end violence against women is an over-simplification of a very serious problem. Yes, men should love their wives as Christ has loved the church; women are likewise called to love their husbands. However, as you have pointed out, humans are inherently sinful, so both men and women have failed to uphold this standard. As a result both sexes have been subjected to violence and abuse. Historically, while men were the victims of violence they had the legal ability to bring charges against the perpetrators; however, women had very little recourse or protection. Furthermore, certain social systems, even within Christian cultures, encouraged the abuse of women under the guise of discipline and/or authority. I’m sorry you had a poor experience with feminist organizations. Frankly, just as not all churches present an accurate presentation of Christianity, there are feminist organizations present a skewed portrait of feminism. But, please, for the safety of all, do not write about violence against women and imply that if men and women were better Christians it wouldn’t happen. This kind of thinking makes it very hard for victims—of both sexes—to come forward and receive help. Can feminism stop violence against women? No. Not until humankind has become sinless will this happen. However feminism has helped to provide legal protection and justice for victims of abuse. "... I believe the number one thing you can do to prevent violence against women is raise up your sons with a true biblical understanding of the value of women, and the role of men." YES! This. Excellent and so true. We have let feminism invade our homes and our churches today and it has ruined our society and our men. Love, your post and so glad I found you through the Graced Simplicity link up! You're right - it has invaded almost every aspect of our lives, and much of the way we think too. Thanks, Chelsey! I am a long time enemy of the feminist movement, not the wonderful words in their manifestos, but rather the behavior and actions of the feminist foot soldiers on the ground. Many of them carry a message much diffrent than the manifesto. I supported the first wave of feminism and securing basic equalities we should all share. However, the feminist movement today is buldozing right over men and it is telling them that they can no longer be men in the way they want to be. No men must somehow circumvent nature to be come a metro-woman/man. Here is my take on the article. Men are beginning to hate women--some more than others. Many of these men have come from a broken dysfunctional family where divorce reaked havoc on their development, and this divorce was caused by feminism poison. So, it is a catch 22. Feminism has brought violence to women by turning men against them, and it has made some men more violent due to the practice of destroying family units and turning young men into rouges without a caring and strong male figure. This is a christian web-site so let me assert first that I am not practicing Christianity. The only women that I would stand up and defend, putting myself in harms way, would be immediate family. ps. The divorce rate in the "Churches" is just as high as the rest of the country. I had thought of looking for a mate at church but then rethought it based on that truth.